BRAND-FIRST personalized branding irons allow you to professionally mark your hand made woodwork, furniture and other creations. MAKES A GREAT GIFT! 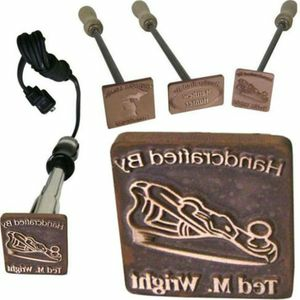 Standard Flame Heated branding iron includes the branding head image of your choice with your name engraved within it and a 12� stainless steel handle with 4� long hardwood grip. OPTIONAL Electric Heated 125 watt, 120 volt branding iron plugs into any household outlet and will maintain a constant temperature. Unit comes with a heating stand for holding the iron while heating, between brands, and cooling down. Click on the image pages above to enlarge and select the image that best suits you. STANDARD IMAGE NOTE: Wording can be modified; images, layout, size and fonts cannot.